Yeah, I know.... not everyone is a brussels sprout fan. I hear it all the time... someone's mother forced them to eat their brussels sprouts before they could leave the dinner table, therefore, leaving an everlasting fear and disgust of these little buggers in their mind. I have to ask, is that really true? Were there that many mother's out there that did this or is it an old wives tale? Either way, I am here to tell you... GET OVER IT! They are crispy, crunchy, and are a wonderful vegetable side dish. In fact, of all the vegetable side dishes that I cook this one is the LEAST boring. There is so much you can do with brussels sprouts and their flavor is divine! I am here as an advocate on their behalf... they deserve another chance. Heat a large saute pan and then add the oil and pancetta. Cook until it is lightly crispy, about ten minutes. Remove from and set aside. Add the onions and cook until translucent, about 5 minutes. Add butter and swirl to melt. Add brussels sprouts and 2 tablespoons of water. 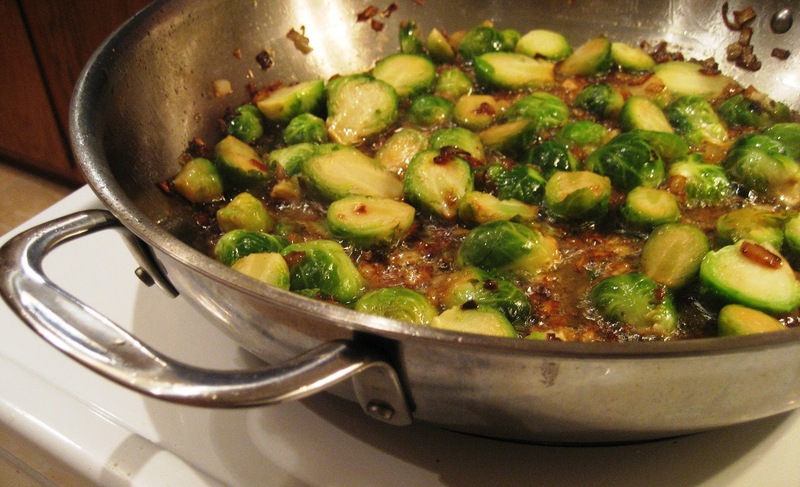 Saute over medium heat until brussels sprouts are tender and bright green, about six to eight minutes. Season to taste with the salt and pepper. Fold in the reserved pancetta and toss to coat. Look at that scrumptious color! If this recipe doesn't make a believer out of you, then fine. Go on without loving these little green goddesses... but, if by chance, you tried this and it changed your opinion of them then please let me know!